ca 500 - 480 B.C. 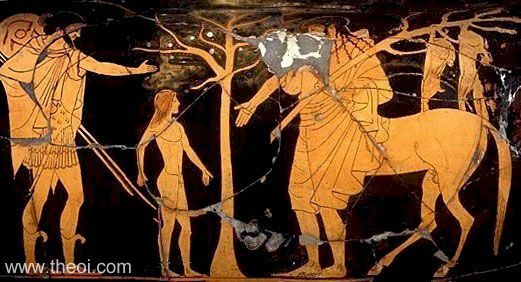 Peleus delivers his son Achilles to the foster care of the wise centaur Chiron. The centaur is clothed in a chiton and has the full body of a man including human legs and feet with the torso and rear-legs of a horse attached to his rump. This is in contrast to depictions of other Centaurs who are entirely equine below the waist. He holds a branch hung with hares--the fruits of the hunt.